This Product is Amazingly Useful !! A Self-Fusing Tape, Made of Fully Cured Silicone Rubber Compound that Fuses to Itself in Minutes to Form a Permanent Bond. Automotive - Marine - Work - Home - Recreation - Emergencies - Uses are Unlimited !! Sealing pipes, electrical wire connections and insulation, hose repair, covering sharp edges, protecting against rust and corrosion. used for general purpose waterproofing and sealing applications, boat riggings and rope tips, wrapping equipment and tool handles and much more!! Weather, water and Ozone resistant. Conforms to almost any surface. Self-fusing silicone creates a permanent water-tight seal curing in 24 hours at room temp.. Easy to apply and to remove - with No adhesives, so no sticky residue left on surfaces. Resists vibration and shock (won't crack or separate with thermal movement) and has Outstanding properties. (Temperature Range -60 to 500F). (Tensile Strength 600psi) (Dielectric Strength 400volts) Can be applied to wet, dirty or oily surfaces. Masking for screws, bolts, terminals, contacts when spraying or powder coating, Replaces heat shrinkable sleeving, tubing and tapes. Note: Faster curing and a harder finish can be accomplished through the application of heat after wrapping. The tighter you wrap the stronger it will be. Your final wrap must be over the tape, not the item. Can be applied to wet, dirty or oily surfaces. 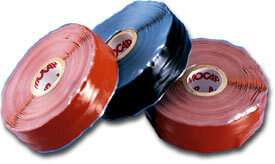 "Must keep tape surfaces clean"
Future wraps will bond to past applications. Because conditions and methods of use are beyond the manufacturer�s control, neither manufacturer nor seller will assume any responsibility for the use or misuse of this product. This product is provided without warranty, either expressed or implied, of fitness for a specific purpose. This includes, but is not limited to, any consequential damages.